in the second round of the 2015 Bank of the West Classic at Stanford. Like Simona Halep, Caroline Wozniacki won her first Grand Slam title this year. And like Halep, Wozniacki lost early in the U.S. Open. The No. 2 seed and two-time runner-up fell to Lesia Tsurenko of Ukraine 6-4, 6-2 tonight in the second round in Flushing Meadows, N.Y.
Halep on Monday became the first top-seeded woman to lose her opening match in the 50-year history of the U.S. Open, losing to 44th-ranked Kaia Kanepi of Estonia 6-2, 6-4 in 76 minutes. After the second round, the highest seed among remaining women is No. 3 and defending champion Sloane Stephens, who grew up in Fresno and still has relatives there. Since winning the Australian Open in January, Wozniacki has failed to reach a major quarterfinal. She lost in the fourth round of the French Open to 14th-seeded Daria Kasatkina of Russia and in the second round at Wimbledon to Ekaterina Makarova of Russia. Wozniacki, 28, had won only one match in three tournaments after capturing the Eastbourne title on grass in June. She retired from her second-round match in Cincinnati two weeks ago with a knee injury after receiving a first-round bye. The 29-year-old Tsurenko, meanwhile, upset seventh-seeded Garbine Muguruza en route to the quarterfinals in Cincinnati. Both Tsurenko and Wozniacki have played one tournament in Northern California. Tsurenko reached the quarterfinals of last year's Bank of the West Classic at Stanford, losing to eventual champion Madison Keys. 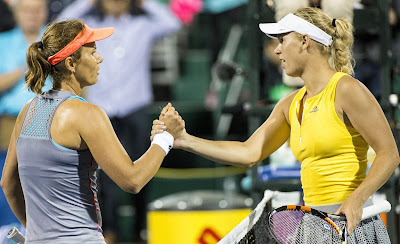 Wozniacki was seeded first in the 2015 Bank of the West Classic and fell to Uzbekistan-born American Varvara Lepchenko in the second round after receiving a first-round bye. The tournament moved to San Jose this year under a new sponsor. In the U.S. Open men's draw, former Aptos Challenger finalists John Millman of Australia and Mikhail Kukushkin of Kazakhstan will meet for the first time on Saturday after upsetting seeds. Millman, the 2015 Aptos champion, toppled 14th-seeded Fabio Fognini of Italy 6-1, 4-6, 6-4, 6-1. Kukushkin, the 2014 Aptos runner-up to Marcos Baghdatis, surprised 23rd-seeded Hyeon Chung, an Australian Open semifinalist this year, 7-6 (5), 6-2, 6-3. With a victory, the 29-year-old Millman can reach the fourth round of a Grand Slam tournament for the first time. The 30-year-old Kukushkin, meanwhile, can equal his best showing in a major. The winner will play either second-seeded Roger Federer or 30th-seeded Nick Kyrgios of Australia. --No. 3 seeds Mike Bryan (Stanford, 1997-98) and Jack Sock of the United States overwhelmed Italians Daniele Bracciali and Marco Cecchinato 6-1, 6-1 in 38 minutes. Bryan and Sock won Wimbledon last month. --No. 12 seeds Ben McLachlan (Cal, 2011-14) of Japan and Jan-Lennard Struff of Germany lost to Italians Matteo Berrettini and Andreas Seppi 7-6 (5), 1-6, 6-4. --Wild cards Nicole Gibbs (Stanford, 2011-13) and Sabrina Santamaria of the United States defeated Alexa Guarachi of Chile and Vera Lapko of Belarus 6-1, 1-6, 6-1. Gibbs and former USC star Santamaria, both former NCAA doubles champions, are scheduled to face No. 2 seeds Timea Babos of Hungary and Kristina Mladenovic of France on Friday. Babos and Mladenovic won the Australian Open this year and reached the 2014 Wimbledon final. --Anna-Lena Groenefeld of Germany and Santiago Gonzalez of Mexico beat Raquel Atawo of Sacramento and Aisam-Ul-Haq Qureshi of Pakistan 6-3, 6-2 in mixed doubles. Atawo and Groenefield are seeded 14th in women's doubles. --Raluca Olaru of Romania and Franko Sugor of Croatia downed U.S. wild cards Danielle Collins and Tom Fawcett (Stanford, 2015-18) 3-6, 6-4 [10-3] in mixed doubles.